Optical Coherence Tomography (OCT) is a non-invasive imaging technology that is used to capture cross-sectional images of the retina in-situ. The retina is the complex light-sensitive film at the back of the eye. Unlike computerised tomography (CT) scans which utilise medical ionizing radiation, OCT can best be compared to ultrasonography (ultrasound). Except OCT uses a different energy source and provides greater detail. 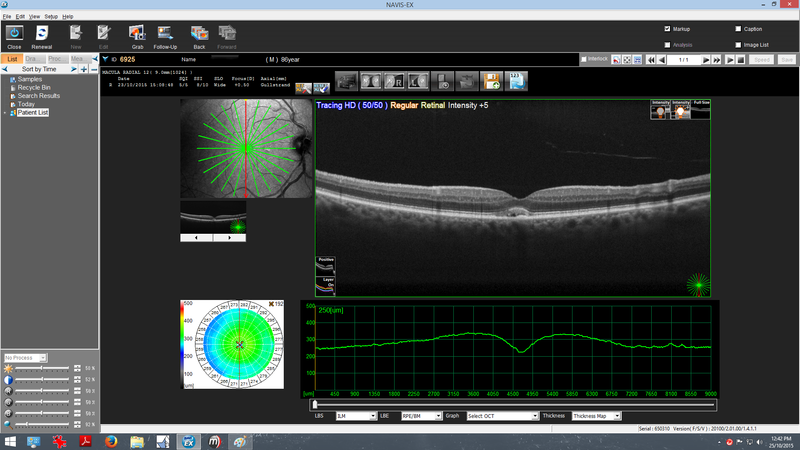 "the most advanced form of retinal imaging currently available"
OCT is safe, does not cause any discomfort and is the most advanced form of retinal imaging currently available. 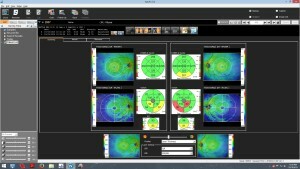 It is essential for providing eyecare of the highest quality. Many patients are familiar with retinal fundus photography, which provides a two-dimensional colour image of the retina and have been a normal part of our examinations for some years now. Fundus photographs are excellent at documenting changes on the surface of the retina, but some retinal problems occur in the underlying layers. The OCT compliments 2-D fundus photography because it shows what is happening in the underlying layers of the retina in 3-D. To assess the health of the retina by just looking at its surface is akin to judging how clean a rug is without looking at what is hidden underneath it. Specific OCT scans may be performed for a variety of reasons, but all patients under our care undergo an OCT screening scan. This gives us an overview of the overall thickness of the retina, as well as the thickness of the nerve fibre layers entering the optic nerve. The screening is done at no extra cost; it is only when abnormalities are detected or for some other symptoms or clinical findings that a detailed OCT scan is ordered as a follow-up. Above right are examples of changes occurring below the retinal surface as displayed by the OCT; these changes are often not visible on the surface of the retina with fundus photography. 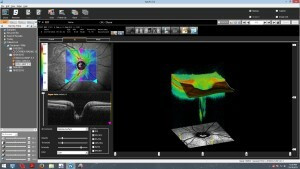 Our ocular coherence tomographer can also be used to take images of structures at the front of the eye and to measure the thickness of the cornea. This has applications as diverse as determining suitability for LASIK refractive surgery, following the progression of keratoconus, assessing the fit of complex rigid contact lenses, or being aware of risk factors for glaucoma. Front-of-the-eye (anterior) OCT imaging can also be used to examine the drainage structures inside the eye, especially to ensure there is space for the aqueous humor (the fluid inside the front chamber of the eye) to freely drain. Impediments to drainage of the aqueous can bring about significant elevation in the internal eye pressure, which in turn can result in angle-closure glaucoma.